El Charrito: Taco truck in Stamford. We have arrived! I take back all my badmouthing of Stamford’s Mexican places. I take back my cursing of Mexican food in general in Connecticut. And, temporarily, I take back all the bad things I’ve muttered about living in this cold Mexican wasteland these past 7 years. 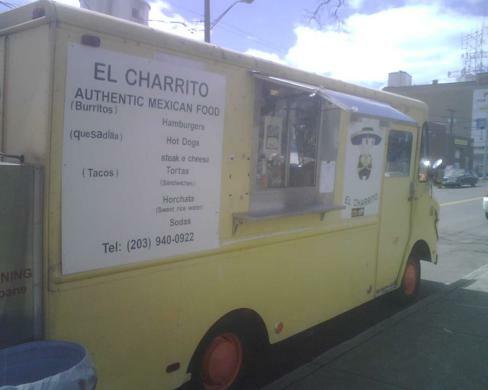 Because today as I was doing errands, I found El Charrito, a taco truck parked in West Stamford. I actually first ate at this truck about a year ago. I saw it parked in the Shop Rite parking lot and had a good taco. Then I never saw it again. The husband and wife that own the truck are extremely friendly. The wife, a Stateside born Puerto Rican, who speaks perfect english takes the orders and will help you navigate what’s good that particular day. The husband, from Mexico, does all the cooking. And he’s good. Today I had a huarache with carnitas. Man, it was awesome. Not just passable, but truly good. Think of a huarache as a thick tortilla, pan fried, about a foot long and 5 inches wide, topped with black refried beans, meat of your choice, shredded lettuce, crema and salsa. Man it was good. the carnitas was good and tender (not as rich as the best carnitas, but better than any other that I’ve had in Stamford). The huarache is all hand made from fresh masa, as are the sopes. For only $4.50, the huarache makes a great lunch. As far as I know, it’s the only place in Stamford that sells huaraches. Huaraches and sopes were the special today. Their regular items include tacos, tortas hot dogs, hamburgers, quesadillas, etc. Plus, they have horchata too. Tacos are $2.50… not sure what some of the other items are priced. They also sell something called sincronisadas, which is something like a big old ham, cheese, beans quesadilla. They said they are there from 11 a.m. to 9 p.m. every day. And, you can call ahead and order your food so it’s ready when you get there. 203-940-0922. I hope it’s as good next time I go.